The Lancia Thema is an executive car produced by the Italian automaker Lancia between 1985 and 1994. The Thema was one of four cars which shared the "Type Four" chassis; the others were Alfa Romeo 164, Fiat Croma and Saab 9000. The Thema was available as a sedan and as a station wagon designed by Pininfarina. The Thema was one of the most spacious and comfortable European cars of its time. The Thema re-established Lancia as a high quality luxury producer after the problems the marque experienced with the earlier Lancia Beta in the 1970s. When Fiat sold one of their factories to Russia, they made a barter deal, getting poor-quality steel instead of money. This steel went into many Fiat products in the 1970s and 1980s and nearly ruined the company. The Thema reversed this trend with a galvanized steel chassis. 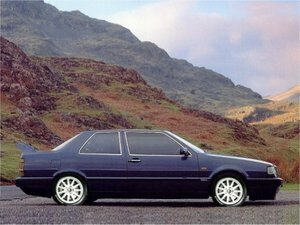 Building quality was higher than the Croma and at par with Saab 9000. However, the sales organisation in many markets was poor, and the secondhand value suffered. The Lancia Thema was dropped in 1994, when the marque withdrew from right-hand drive markets (including the United Kingdom) because of a fall in popularity. But Lancia continued to be one of the most popular manufacturers in the Italian market and the Thema's replacement, the Lancia Kappa, helped the marque sell its products well. The engines originated from a Fiat series designed by Aurelio Lampredi, famed engine designer formerly of Ferrari and Alfa Romeo. The straight-4 2.0 L petrol engine, available in both naturally-aspirated and turbocharged versions, was refined and offered good performance. Earlier Themas were also delivered with the 2.8 L PRV V6 engine, developed in cooperation with Peugeot, Renault, and Volvo. This engine was replaced in 1992 with a 3.0 L V6 Alfa Romeo engine, regarded by many as one of the best V6 engines ever made. The ultimate Thema, the 8.32, used a 3.0 L Ferrari Dino V8. This engine was based on that of the Ferrari 308 qv with some being assembled by Ducati from castings made at Maranello and featured a traditional V8 split-plane crankshaft rather than the flat-plane used in Ferrari cars. It produced 215 bhp (160 kW) and was capable of 149 mph (240 km/h) in its Series 1 incarnation. The Series 2 engine was slightly detuned to 205 bhp (153 kW) and was slighty slower. It had good performance (though the Turbo version was quicker than the Series 2 from 0 to 100 km/h) and excellent refinement, including a luxurious wood-and-leather interior by Poltrona Frau; it had the same luxury equipment as the LX versions. But a £40,000+ price tag in Britain, and the fact that only left hand drive models were produced, limited its appeal, with only 9 being officially sold there. It was even a rare sight on Italian roads, with just 3,537 built between 1986 and 1991.